Preston Prescott is an associate member of the Circle of R.O.P.E., a protégé of Max Indeks and the favored pupil of Madame Mynx, all of which amounts to a pretty impressive criminal résumé. He’s also head over heels in love with his associates’ arch-nemesis, Pink Pussycat. Preston grew up in Grime City, the most downtrodden section of Metrobay. As a child he was tormented by bullies and picked on for his small stature and anti-social behavior, yet showed a keen and remarkable mind. Preston cultivated his skills throughout the years, displaying a natural knack for business and entrepreneurial endeavors. Preston attended Metrobay University on an academic scholarship, studying under the friendly tutelage of his great uncle and academic adviser, Gilbert Petto. Their relationship turned sour, however, when Preston started to question Gilbert’s methods and openly mocked the kindly old man’s expertise in favor of that of a new mentor, Max Indeks. After graduating from college with high honors, Preston spent many years unsuccessfully trying to open his own business, each brilliant idea crushed before it ever got off the ground due to a lack of capital. Max, however, saw great potential in the driven young man and offered him funding and an apprenticeship in exchange for applying his vivid imagination to various R.O.P.E. endeavors. Desperate, poor, and spiritually broken, Preston agreed to join Max’s evil organization, thankful to have someone take an interest in his talents. Before the ink on his first check had dried, Preston had become an apprentice of sorts to Max Indeks and a high ranking supervisor at Max’s APEX Industries, Inc. But Max’s generosity did not come without fine print, and Preston soon found himself hard at work devising schemes and equipment for the villains to help in their struggle against the Superheroine Squad. He personally had a hand in creating such devices as the Modification Machine, the Personailty Exchanger, the Greentooth Earpiece, and even the advanced A.I. codenamed Sentius. He has collaborated on projects with such brilliant minds as former APEX technicians Ted Twiss, Belinda Giolla, Marcy Smith, and Shelley Calvin. As his work became more and more illegal and unethical, Preston’s conscience began to tug at his good nature. Perhaps sensing this, Max began to pair Preston up with Madame Mynx, a seductive femme fatale that became the devil on his shoulder, tempting him with aspirations of power, control, wealth, and women. Mynx herself was rather intoxicated by the handsome young scientist and began to carefully groom him into a man after her deepest, darkest fantasies. But Madame Mynx’s devil soon met her counterpart angel. The beautiful, alluring, and pure-hearted crimefighter Pink Pussycat arrived in Metrobay, taking the city by storm and quickly became a dangerous threat to R.O.P.E. and their financial interests. By now, Preston was deeply involved in many criminal schemes, often serving as the mastermind behind various crimes, and it did not take long for him to come face-to-face with Pink Pussycat. Perhaps sensing Preston’s growing affections, Madame Mynx and Max Indeks arranged for him to be inducted into the Circle of R.O.P.E. and began his initiation with a perverse sexual ritual. He was blindfolded and told the other party was a willing companion, but was shocked to discover a bound Pink Pussycat had been his partner, instilling a deep-seated bitterness towards him in her. Preston, however, was infatuated with her from the very start. Having spent the vast majority of his life in the presence of older vixens such as Madame Mynx, he was caught off guard by Pink Pussycat’s energetic spirit, youthful beauty, and wholesome disposition. He had never met a woman like her and soon enough his interest in her grew into a powerful obsession. Preston admired everything Pink Pussycat and her Action Cats teammates stood for, which to his shame and disappointment was contrary to many of the projects and schemes he was currently involved in. He was heartbroken to learn that she considered him a villain for his misguided actions, and more distraught when he realized that he really WAS one of the ‘bad guys’. He found himself torn inwardly, longing to win her heart and soul while simultaneously desiring to dominate her mind and body like his peers so often encouraged. Unable to cope with his maddening emotions, Preston came to a difficult decision. Pink Pussycat could never love him. He would always be a villain. He was Max’s trusted associate, Madame Mynx’s greatest pupil, and one of the most heinous men in Metrobay. Pink Pussycat could never love Preston Prescott, so the only solution was to become someone completely different. Preston devised a secret identity, that of a noble and powerful hero, one whom he believed would be capable of wooing the amorous Pink Pussycat. But it was not enough to change his appearance. Ashamed of his own sinful nature, he realized his mind must be transformed as well. After much debate, Preston secretly submitted himself to the Modification Machine’s process, transforming him both physically and mentally into a paradigm of virtue and righteousness. As a hero, Preston Prescott was no more; in his place was a veritable god amongst men, the dark and mysterious crimefighter Adonis. But somewhere deep in the recesses of Adonis’s subconscious lurks the REAL Preston, and it is only a matter of time before the two sides of this man’s personality come into conflict, and Pink Pussycat may find herself caught in the middle. As Adonis, Preston has fought against the very people who made him what he is. As Preston, he feels great conflict about his actions and has become even more isolated and anti-social. He’s coped by developing an advanced artificial constructed, name Aida, to provide him a modicum of social familiarity, kinship, and sanity. His recent successes as Adonis have also endeared him to the Action Cats, the Superheroine Squad, and others. Pink Pussycat herself has admitted to being infatuated with the handsome hero, and fellow crimefighter HoneyDollhas also made advances on him. Inversely, Max and Mynx have forced Preston to adopt the supervillain alias of Blindside, a criminal mastermind in a power suit capable of distorting the senses of whomever his targeted victim is. 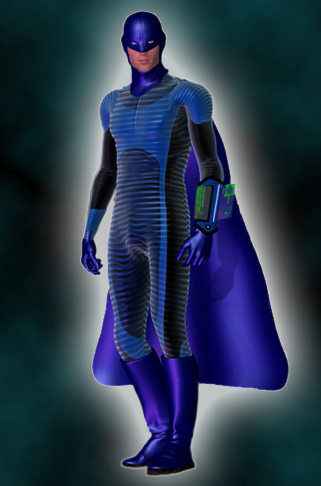 While Preston has reluctantly assumed this alternate identity, chiefly to help his true allies from the inside, they remain unaware of his intentions and view Blindside as a pure villain, and even Preston finds the psychological effects of hiding behind a supervillain persona intoxicating and addictive. As Adonis, Preston possess superior strength, speed, and stamina, equivalent to that of an Olympic athlete in peak physical condition. Without his enhanced abilities, he is also one of the most brilliant men in Metrobay with an intellect almost unrivaled, and has applied his skills towards creating things years, if not decades, ahead of their time. 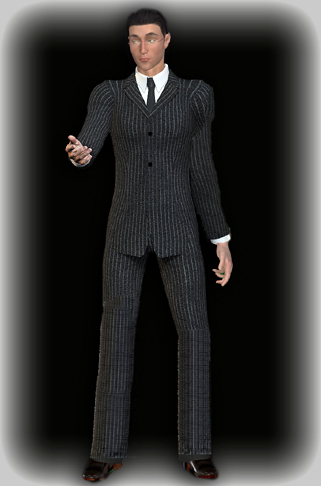 As the villain Blindside, his power suit augments his strength and stamina. His suit controller also enables him to project a sensory blast of energy designed to disorientate, blind, and confuse the target, leaving them entirely vulnerable and susceptible to attack or capture.